The new law would require food carts and trucks to post a letter grade that is based on their most recent health inspection by the City Department of Health and Mental Hygiene. The letter-grade signs that New Yorkers see displayed in the windows of their favorite brick-and-mortar eateries are on their way to mobile food vendors after the City Council voted last week in favor of a bill that would require food carts and trucks to post a letter grade that is based on their most recent health inspection by the City Department of Health and Mental Hygiene. In Albany last week, as the State Senate prepared to vote on a bill sponsored by Sen. Jose Peralta (D-East Elmhurst) to assign letter grades to pushcarts and food trucks, the Senator and members of the Independent Democratic Conference issued a report, “Grades-on-the-go: An Inside Look into the Dirtiest Pushcarts & Food Trucks in New York City,” that analyzed inspection data from 2016. According to Peralta, while mobile food vendors are inspected the City Department of Mental Health and Hygiene, the results of said inspections are not made public. Peralta’s legislation would assign letter grades to pushcarts and food trucks just like restaurants and make it easier for DOHMH to obtain locations for inspections. 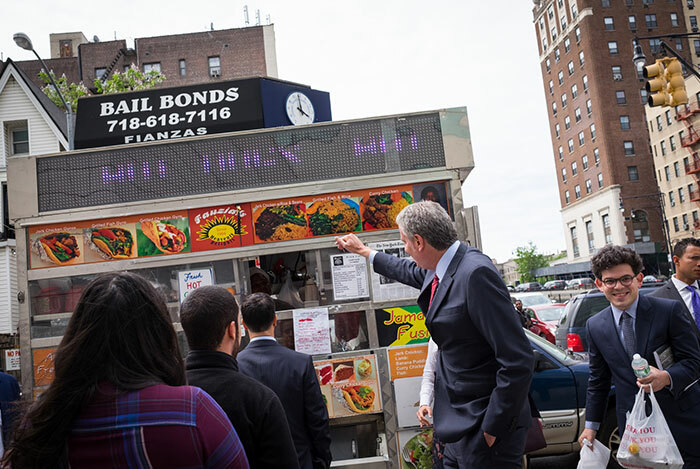 The report indicated that the six dirtiest food trucks in the city where inspectors issued violations could have resulted in a “C” grade, including one Queens cart posted on 71st Avenue in Forest Hills. Peralta said that in order to improve the sanitary conditions of these trucks and to provide consumers with easy access to information on the cleanliness of these establishments, his legislation would require that DOHMH convert the existing health inspections into the letter-grade equivalent. “At the New York Food Truck Association, we think food trucks should be held to the same food safety regulations as brick-and-mortar restaurants, not only including letter grades, but also addressing the onerous food safety permitting process for food truck employees,” said Ben Goldberg, founder and CEO, New York Food Truck Association.